ORESTES, IN – Lois Ann (King) Stevens, 87, Orestes, passed away on Saturday, July 14, 2018 at the Alexandria Care Center following an extended illness. She was born in Orestes in February 25, 1931 to Fredrick and Nellie (Norris) King and has lived there all of her lifetime. Lois was a graduate of Alexandria High School-Class of 1949. She was a member of the Orestes Christian Church, the Orestes Pythian Sisters, the Orestes Historical Society and the Orestes Community Pride Committee. Services honoring Lois Ann’s life and legacy will take place at 2 pm on Friday, July 20, 2018 in the Owens Funeral Home, 412 North Harrison Street, Alexandria. Rev. Courtley Granger will officiate. Interment will follow in the I.O.O.F. Cemetery in Alexandria. Friends may call at the Owens Funeral Home from 5 pm to 8 pm on Thursday. Memorial contributions are suggested to the American Diabetes Association or the American Heart Association with envelopes available at the funeral home. 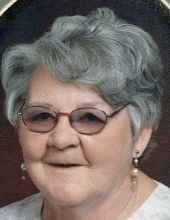 To send flowers or a remembrance gift to the family of Lois Ann (King) Stevens, please visit our Tribute Store. "Email Address" would like to share the life celebration of Lois Ann (King) Stevens. Click on the "link" to go to share a favorite memory or leave a condolence message for the family.